Looking to Learn About Greyhounds and Greyhound Racing? A quick search on the internet will lead you to a great deal of information. Unfortunately, most of it is inaccurate and/or out dated. Half truths and misinformation lead to myths, so we’re exposing and refuting them with FACTS! 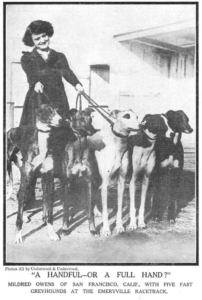 Busting the Florida Hysteria Myth of "Thousands of Greyhounds"
Way back in 1919, the Blue Star Amusement Company built an oval track in Emeryville, California, so a mechanical lure invented by Owen Patrick Smith could be used for racing greyhounds. Smith intended to charge spectators 99 cents to watch the exotic dogs race. In 1931, Florida became the first state to legalize dog racing. Because of its climate, Florida became an epicenter for greyhound racing. Celebrities were often spotted at dog tracks. Frank Sinatra played an unlucky Miami greyhound bettor in the 1959 “A Hole In The Head” movie. The Constitution Revision Committee (CRC) is supposed to be a citizens input to the Florida Constitution. The CRC meets once every 20 years to tweak and add Amendments to the Florida Constitution as necessary. Amendment 13 tabled with financial support from The Humane Society of the United States and Grey2KUSA Wordwide. 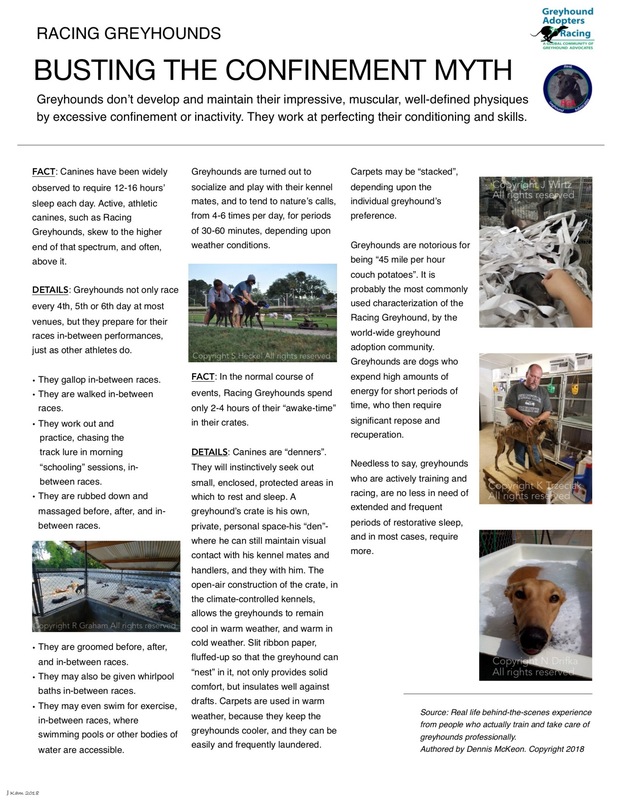 The Florida Greyhound Association, Committee to Support Greyhounds, Greyhound Adopters for Racing, and various other groups came together to fight the Amendment, and the lies it was based on. Unfortunately, on November 7, 2018, Florida voters passed Amendment 13, which bans dog racing and wagering on dogs by 2020. It is important to look at the wording of what Amendment 13 passed. It did NOT make greyhound racing illegal, which is actually only illegal in one state – Idaho. 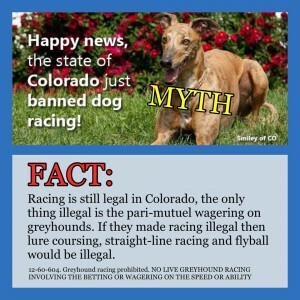 The amendment made betting and wagering on dog racing illegal. Greyhounds are dogs, just like weiners dogs who participate in weiner dog races are dogs, and just like dogs that participate in lure coursing. As of December 31, 2020, any betting on those will be illegal too. 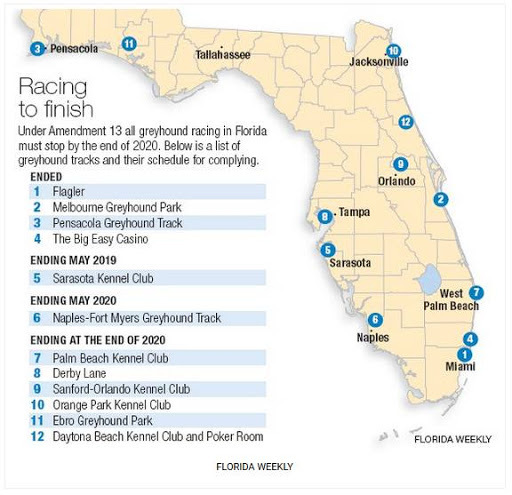 Following the passing of Amendment 13, the administrators at 6 of Florida’s 11 tracks committed to stay open the remaining two years. Most of those planning to continue racing run year-round tracks, whereas most of the seasonal tracks that were closed as of November are unlikely to reopen. “What will happen to the thousands of racers now?? Rory Goree, president of the Greyhound Pets of America, said in a statement about the vote that there is no urgency in finding homes for dogs because most will continue racing. 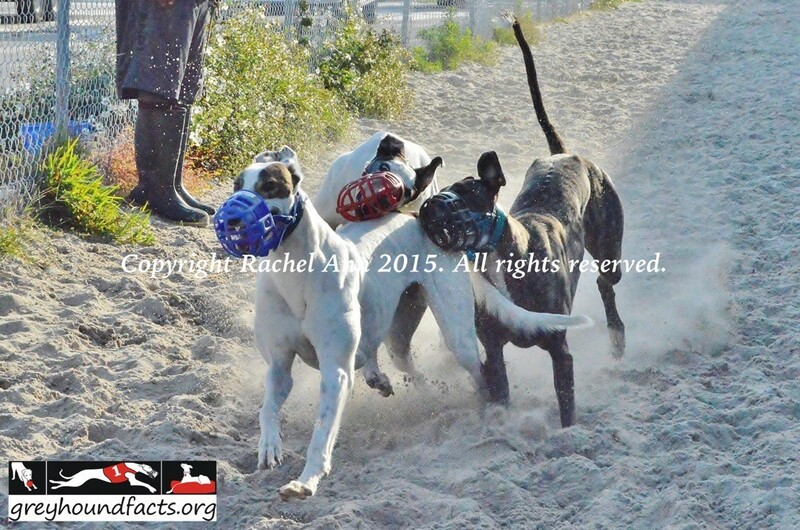 It has not been an anomaly for greyhounds to ‘race the Florida circuit’ while the seasonal tracks are open. Here are two dogs that are currently racing at Wheeling. Like many racers, both have traveled to seasonal tracks throughout their careers. Track Availability – There are nine other tracks in the NGA circuit. Four tracks are seasonal. Five tracks race year round. These tracks are not at their full capacity, either. 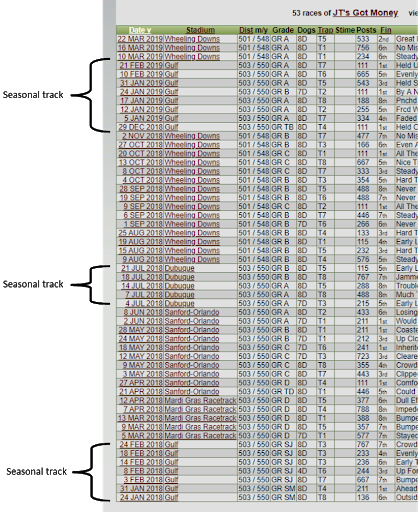 Kennel availability – Photographed below are the kennel compounds for Wheeling Island and Mardi Gras (TriState). In accordance with the West Virginia Racing Commission Greyhound racing rules, each kennel shall consist of no less than 50 crates, and must have an active list of at least 35 dogs. Most kennels have between 60-80 racers. Is there booking space? Yes. Is there kennel space? Yes. Talent availability – The different tracks do have different levels of talent, and different dogs do better at different tracks. The purse points make that pretty clear, and trainer know which dogs will do better at which tracks. There are opportunities for the various remaining tracks to allow for different distances and even a change in grading to allow for newbies and different talent to continue racing. As shown on the right, Tri State / Mardi Gras in West Virginia recently added the 330y distance to their race distances, as well as the 770y. This opens up the field of racers that could race at Tri State for example. 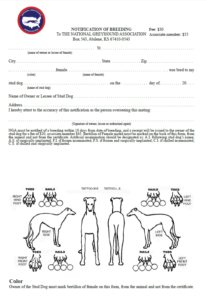 Every breeding – accidental or planned – must be reported to the National Greyhound Association. 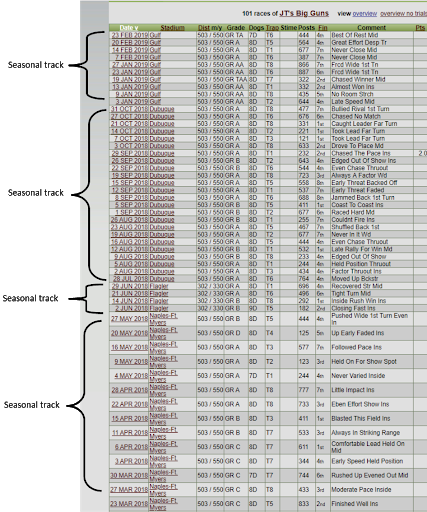 There is form and a $30 fee for each breeding reported. If a breeding is NOT reported in a timely fashion, there are associated penalties. Breeding is a planned process, with lineage and genetics, talent and various other elements taken into consideration. Owners are not breeding just for the heck of it. The National Greyhound Association releases reports on all breedings several times a year. On the right are the number of reported successful breedings* since 2012. 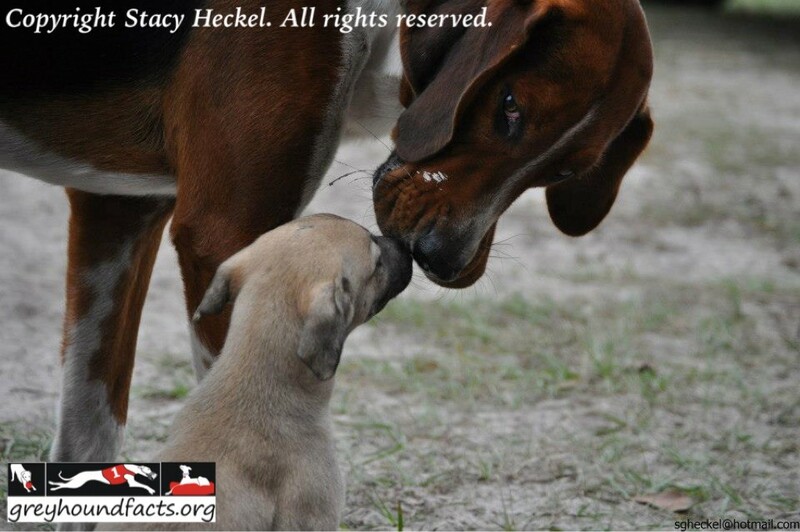 This isn’t whelping – this is actual breedings. Breedings are on the decline. Part of this decrease has been a result of more careful and planned breedings for quality over quantity. From 2014 to 2018, there has almost been a 1,000 decrease of successful breedings. *A successful breeding is one where there isn’t a reported abortion, miss or other (i.e, the dam passes away, conception cannot be determined). Every whelping – alive or stillborn – must be reported to the National Greyhound Association. 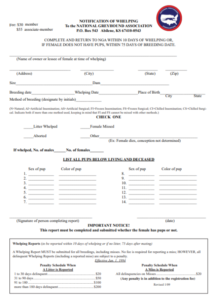 There is form and a $30 fee for each whelping reported. If a whelping is NOT reported within 10 days of whelping, there are associated penalties. Again, strict reporting and accountability. 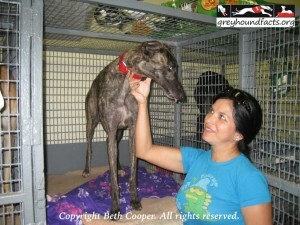 The National Greyhound Association releases reports on all whelping several times a year. On the right are the number of reported whelpings since 2012. There is a similar decrease in the number of pups whelped over the same time period as the decline of successful breedings. 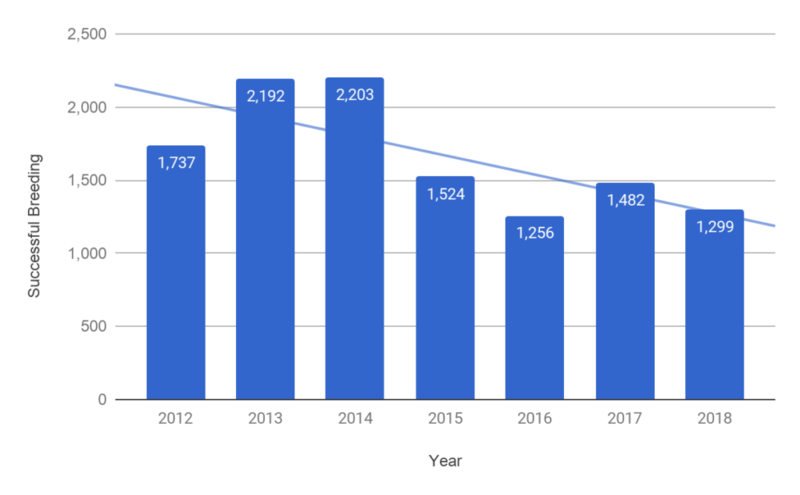 As of March 2019, there are 9,432 greyhounds aged 16 months and younger in various stages of training. When looking at total whelped numbers, it is important to remember that not all whelped pups make it to the track. Some unfortunately pass – like other breeds – due to Fading Puppy Syndrome. Others may be too small to safely race, or some have medical issues that would be inappropriate to start training, or some head to be pets or some flunk out from training school. Here is the time period as reported in the Spring Review for 2017, 2018 and 2019 for breedings and whelpings. Again, a decrease in just this period alone over the last three years. What will the next Summer issue show? Probably more of the same as owners and breeders become conscious of the future of greyhound racing. 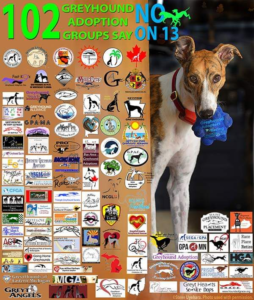 There are 147 National Greyhound Association Endorsed Responsible Adoption Groups. 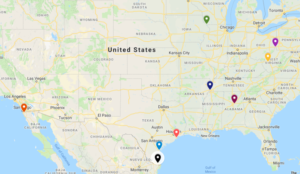 In a 10 day period from March 16-26, 2019, there were 7,241 individuals greyhounds that ran a race. Even if all 7,241 active racing greyhounds retired today, that is only 49 dogs each for the 147 groups. Even if all 9,432 greyhounds at training school and on the farm were retired today, that is only an additional 64 dogs each for the 147 groups. Many, if not all, of the 147 adoption groups have waiting lists. So. Where are these “thousands” of dogs?? Females are given low-dose testosterone in oral form to inhibit their reproductive cycle while racing. It does not enhance their ability to race, but does allow them to compete with the males equally and safely. Females in estrus would attract the males, leading to fights and stress. Good racing females go on to produce puppies, proof of the safety of the dose. The Florida Division of Pari-mutuel Wagering permits the use of veterinarian prescribed chewable tablets, or capsules, for the control of estrus under 61D-6.007. Females receive the oral form once or twice per week, depending on the dose. Today, this low-dose form of birth control is not administered by injection. With its short term use, the chance of negative side effects is significantly reduced. Females who show sensitivities do not receive any further treatments. In addition to preventing unintentional pregnancies, low-dose testosterone also prevents pyometra, a life-threatening hormonal disease caused by repeated heat cycles. Approximately 10,000 puppies were whelped per year from 2012-2015. 9,488 were whelped in 2016 and an all time low of 7,181 in 2017. Through the use of safe, responsible, birth control methods and selective breeding, the numbers are kept in check. 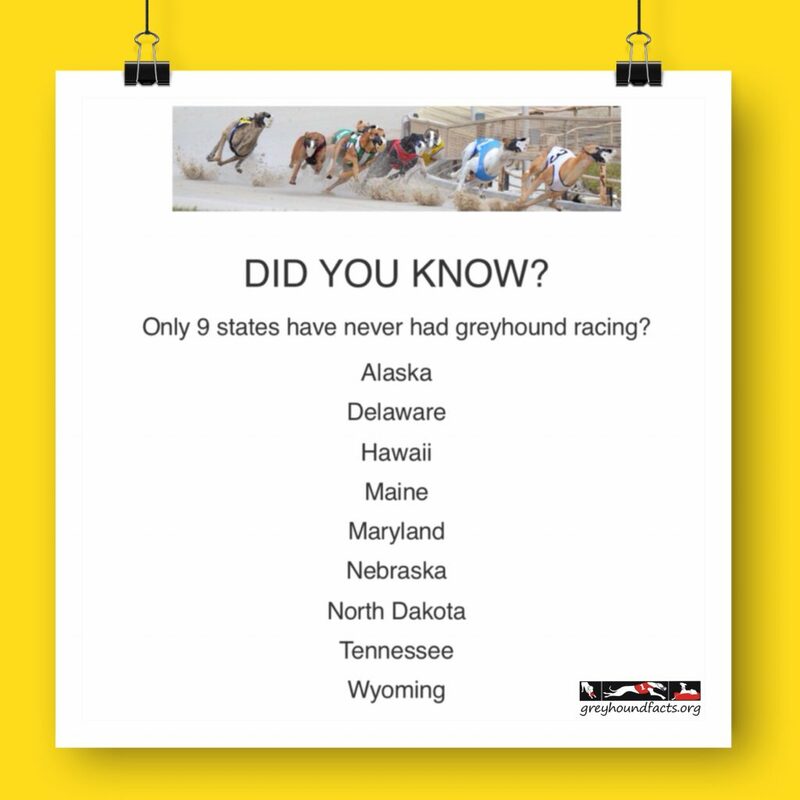 Greyhound Racing is Illegal in (X) Number of States. 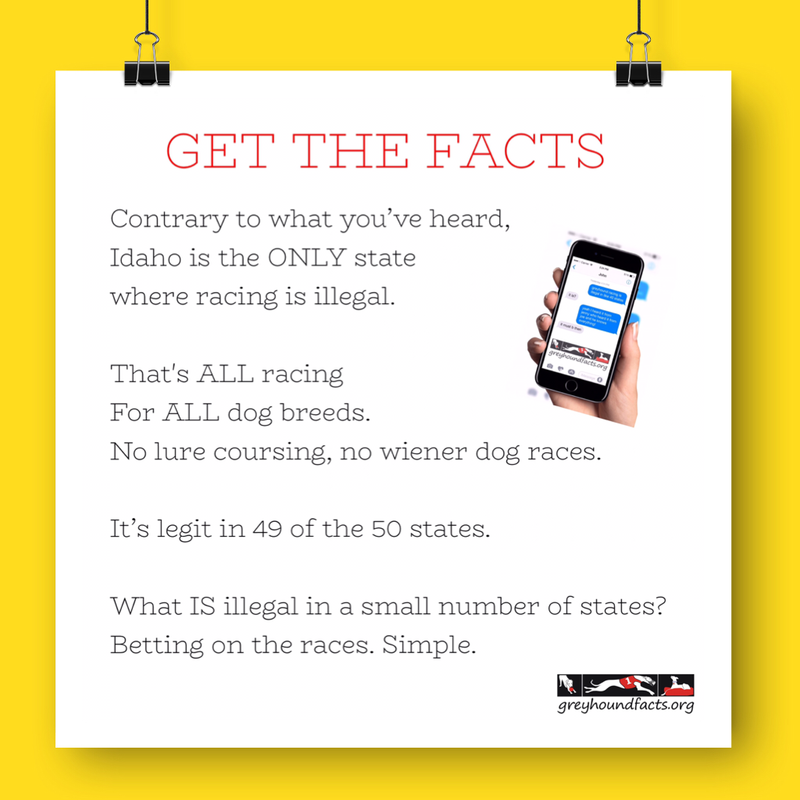 Contrary to what you’ve heard, Idaho is the ONLY state where racing is illegal. ALL racing for ALL dog breeds. No lure coursing, no weiner dog races. It’s legit in 49 of the 50 states. 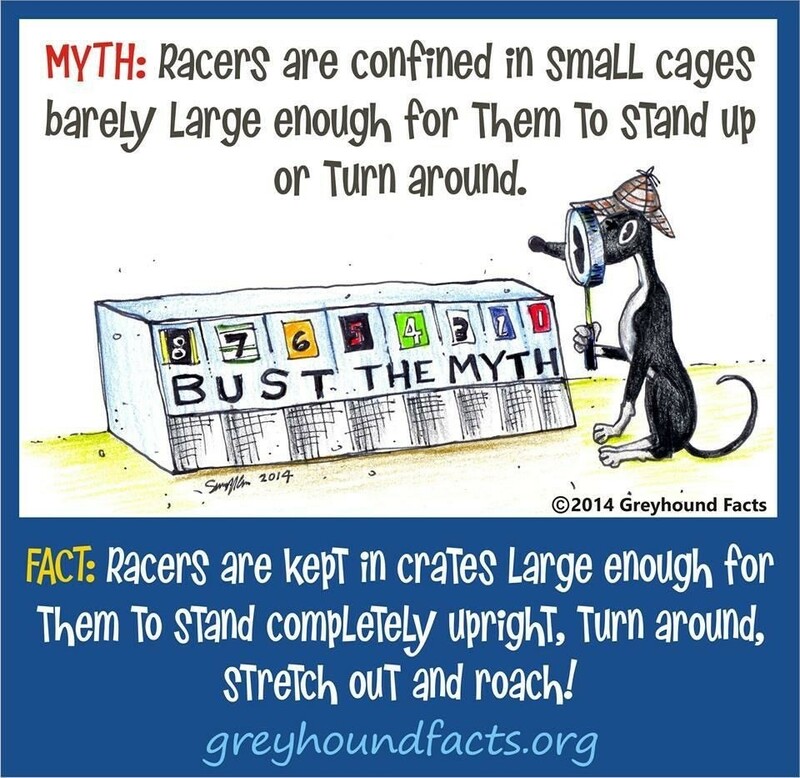 A common misconception about racing greyhounds is that they spend the majority of their lives confined to small cages with little human contact. Dogs spend an average of 12-18 hours each day sleeping or resting (with most greyhounds closer to the high end) regardless of whether they are loose or crated, in a home or at the track. At the track, that sleep and rest time is spent in comfortable, individual crates. The regulation track crates are larger than the crates typically used in homes for pet greyhounds. They can comfortably stand, stretch out, roach or even share space with their favorite trainer in those crates. When visiting a racing kennel it is quite obvious from the dogs’ behavior that they are comfortable, content and secure in their crates. As professional athletes, racing greyhounds also have to receive appropriate exercise and activity to stay in shape and perform their best. They spend the rest of their time playing and hanging out with their kennel mates in the turn out pens, interacting with their trainers and kennel staff, and being checked over thoroughly and massaged to make sure they are sound before, and after their races. Time is also spent training to race as well as racing. A common myth is that greyhounds are only introduced to other canine breeds when they retire. 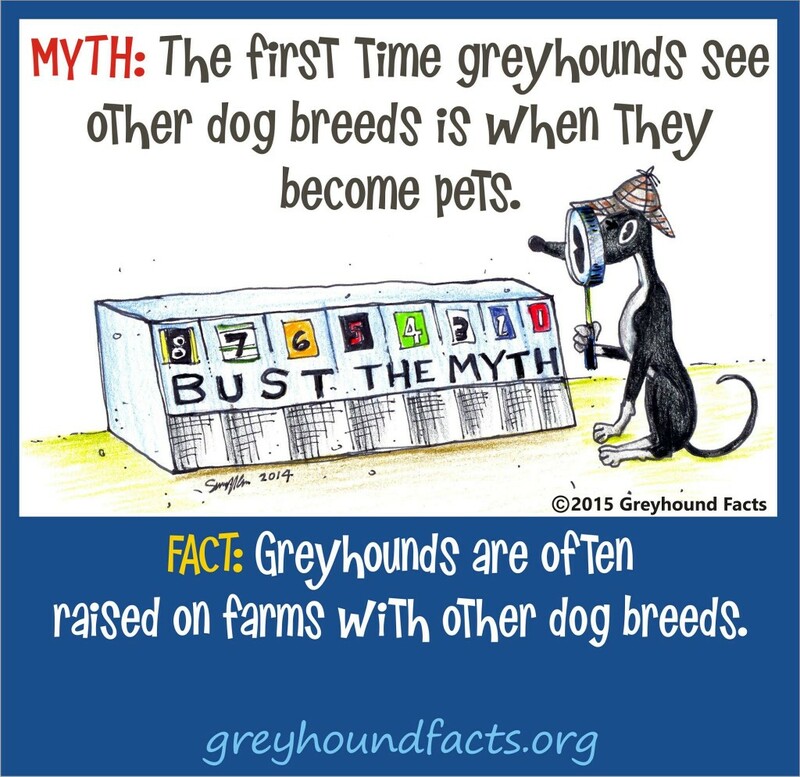 The truth is that many greyhound farms have other dog breeds that run and play with the greyhounds! 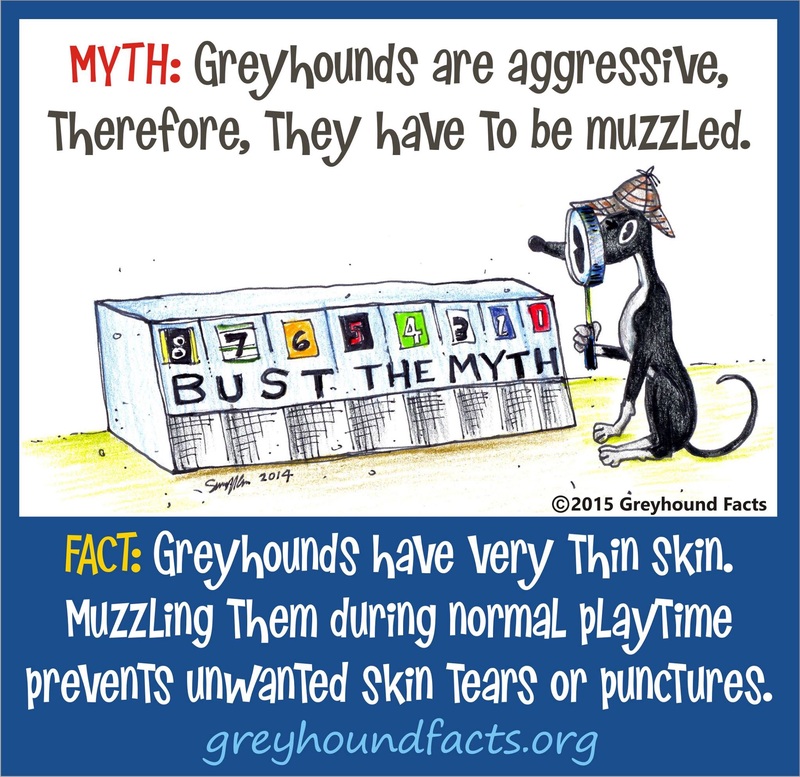 For those of you who are unfamiliar with greyhounds, these dogs have notoriously thin skin. Normal mouthy dog play will tear holes in it. 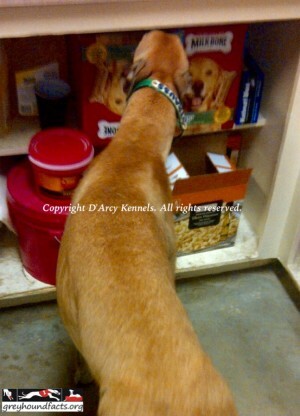 Some believe that greyhounds have never had treats and toys until after they retire from racing. All kennels give their dogs treats and each trainer has their own treats of choice, such as marshmallows, Milk Bones, bully sticks and shank bones. While growing up on the farm they have toys to play with. Many race kennels also have toys. Of course a muzzle or an empty bleach bottle are just as fun as those bought at the store. Strauss picks out his own treats. Greyhounds Are Forced To Race. I came across an interesting article today. The thrust of it is something breeders of sporting and working dogs have known for a long time. But of course, there is a heritable and collective consciousness within species and breeds of animals. Not all things they do are learned. Not all behaviors they exhibit are simply to please us, or in spite of us. Some things are just etched upon their DNA, and they couldn’t care less what we think of it. That’s why Doberman Pinscher dogs warn and protect. It’s why Huskies mush. It’s why Shepherding dogs herd. It’s why Labradors retrieve. And it’s why Greyhounds race. 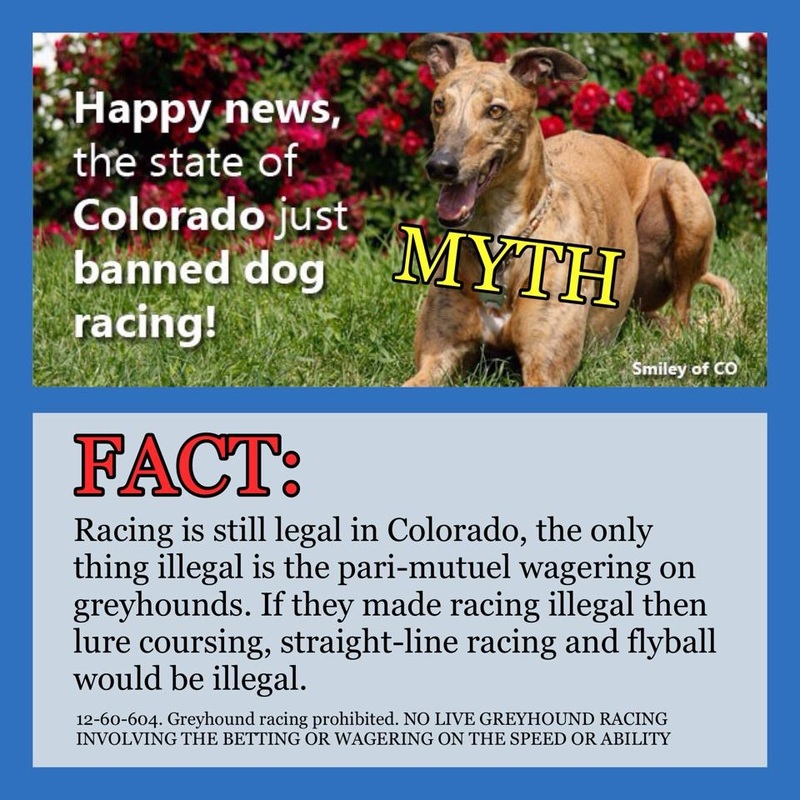 It’s also why greyhound breeders, trainers, and others who are truly knowledgeable of the breed, take extreme exception to the oft-repeated fable and fallacy, that by some sinister spell of dark magic, greyhounds are “forced to run” by their breeders and handlers. Like most of the popular mythology of the Racing Greyhound, nothing could be further from the truth. A greyhound who doesn’t revel in the gifts of his own speed and grace, a greyhound who isn’t inclined to compete with his littermates and pack mates, or a greyhound who does not choose to chase after game or lures—they are the anomalies. For a breed of considerable antiquity, such as the greyhound, these things are self evident, to anyone who has even the slightest familiarity or experience with the modern, racing Greyhound. I have no idea why it has taken science so long to catch up with what King Canute and his subjects knew in the 11th century (see: The Forest Laws by Martin Roper), and what rural, agrarian, wide-open-spaces America has known since pioneer times. Greyhounds are running, hunting dogs, who are furiously competitive when doing so, and who are completed — made whole–by the very act of partaking in the chase. Far from being “forced to run” by humans, a greyhound’s every nerve, fiber, sinew and cell demands that he run. He is compelled to do so, by voices so ancient and powerful that we, in our suburban idyll, cannot even imagine their resonance. As a former professional greyhound trainer, I would love to be able to sit here and tell you all that each and every greyhound who was placed in my hands, owed all of his/her success to my consummate skills and intuition, as someone who trained them, impeccably, to run and compete. 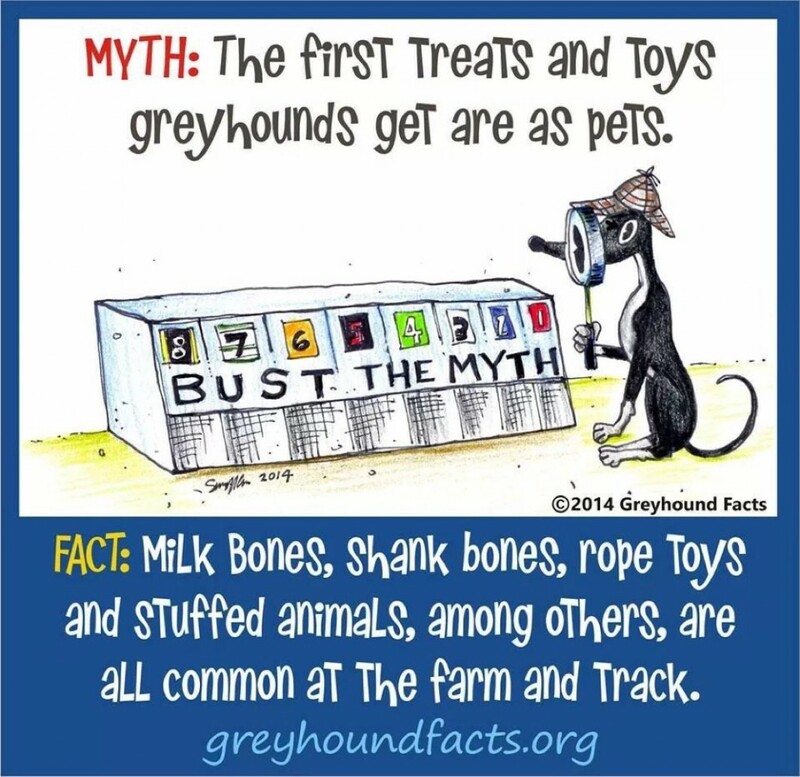 But that would be yet another myth to add to the litany of greyhound mythology already out there for public disinformation. The truth is that the trainer’s job is to give the greyhound ample opportunity, repetitions and time to hone the skills he already possesses, and to nurture the drives and desires the greyhound is born with. We merely allow them to express themselves. We don’t teach them to race and to compete. They already know how to do that. We simply evaluate where they are, physically, mentally and competitively at any given time, and we try to maximize each greyhound’s competitive potential and physical conditioning. A greyhound who does not wish to race, simply doesn’t race. They either refuse to break from the starting box, or they quit the chase shortly after the race begins. I have never known anyone who could “force a greyhound to run”. Neither has anyone else. It might surprise you to learn that some great greyhounds, even breed icons like Rinaker and Dutch Bahama, declined to race at one point or another in their careers. And no one could force them to do it. They decided for themselves, if and when they would or wouldn’t. Greyhounds are like that, as many of you may know. Inasmuch as that is certainly the case, by whatever mechanism, and has been for hundreds of generations of sporting Greyhounds, it behooves us to ask ourselves what the real “cruelty” is. Breeding and enabling them to race? Or forcing them not to?